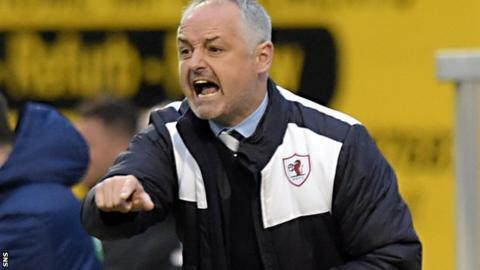 Relegated Dundee United have confirmed Ray McKinnon as their new manager on a three-year contract. McKinnon, 45, resigned as boss of Raith Rovers on Wednesday after agreeing to take over at Tannadice, where he enjoyed two spells as a player. The former midfielder succeeds Mixu Paatelainen, who left United on 4 May after their drop to the Championship. "This is a wonderful opportunity at a club that is close to my heart," McKinnon told United's website. "I am looking forward to taking on the task of rebuilding the club and developing the talent required to get us where we should be. "There are a lot of challenges ahead and it is important that we give ourselves every opportunity to succeed. We will work hard to build a team that the United fans can be proud of. "I want to thank everyone at Raith Rovers. I really enjoyed my time there and I am grateful to them for being so understanding of my desire to become manager of Dundee United. Raith Rovers are a fabulous, proper club whom I wish all the best." Raith missed out on promotion via the play-offs and McKinnon had a year left to run on his contract at Stark's Park. He joined Rovers last summer after three years in charge of Brechin City. McKinnon led Raith to fourth place in the Championship, but they lost 2-1 on aggregate to Hibernian in the Premiership play-off quarter-finals. United were bottom of the Premiership for most of the season with Jackie McNamara replaced as manager after only one win in their first nine games, but Paatelainen was unable to inspire a turnaround in fortunes. Defeat by city rivals Dundee on 2 May ensured United would finish at the foot of the table, and they were docked three points on Wednesday for using two ineligible youngsters in their win at Inverness last week. McKinnon will watch United's final game of the season on Saturday away to Kilmarnock from the stands.